Even in regular business use, tablets have a tough life - we drop them, knock them and spill drinks on them. Take your tablet outside in a workshop, on a building site or on a mine site and things get even tougher. To help you choose a tablet that can take the punishment, we’ve compared five of the best rugged tablets for 2019. Compared to standard tablets, rugged tablets are generally heavier, bulkier and more expensive. But when you look at what you get and how often non rugged tablets fail when used outside, the higher price makes sense. In the long run, your investment pays off because of the durability. Manufacturers like Getac & Panasonic offer thorough three year warranties as a vote of confidence in how tough their hardware is. What makes a tablet rugged? One important specification is meeting the Military Standard 810G rating (MIL-STD-810G). To meet this the device must pass tests including drop durability, high and low temperature tests and resistance to humidity, shock and other challenges. The other important measurement is meeting the IP65 standard for liquid and dust intrusion. Let’s look at five different tough tablet options with a variety of screen sizes, operating systems (Windows or Android) and price points. 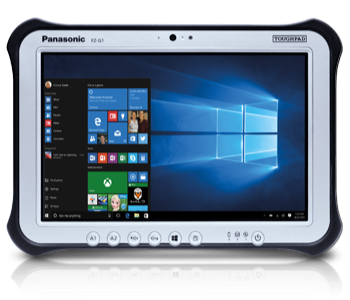 The Panasonic Toughpad FZ-G1 is rugged tablet running on Windows 10 with a beautiful 10.1” display. The FZ-G1 is thin and light (1.1 kg) compared to other tough tablets while still having full MIL-STD certification and meeting IP65 dust and water-resistant standards. All of this comes at a price - it’s one of the more expensive options but for the price you get a market-leading rugged tablet from one of the best manufacturers in the industry. The 10.1” screen has a 1920x1200 resolution and is bright enough to use outdoors in daylight. Gorilla Glass II makes the screen durable and it can be used with gloves on. Summary: One of the best rugged tablets available. Big screen and light weight makes it a premium option but at a higher price point. Getac are another leading manufacturer of rugged hardware. The Getac F110 has a huge 11.6” screen - one of the biggest screens available on a rugged tablet. 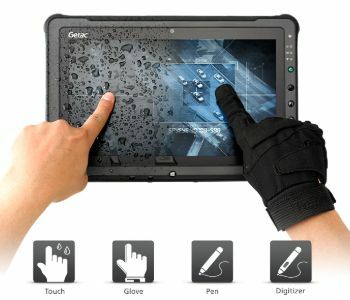 This is also a great tablet for workers who wear gloves - the large screen and glove-touch technology make it very usable in cold environments. There are a few downsides - the F110’s screen resolution of 1366 x 768 is lower than the FZ-G1. It also comes in slightly heavier at 1.39 kg. The extra size and weight is because it is built tough with a textured polycarbonate case attached to the solid magnesium frame with extra bumpers around the edges and corners. This is a big, tough tablet that is certified as fully rugged, meeting MIL-STD and IP65 requirements. The Getac F110 has two batteries which means you can remove one battery for charging without turning the tablet off. Getac back the toughness of their tablet up with a three year warranty that even covers accidental damage. Summary: Recommended if you need the bigger screen and hot swap battery functionality. The comprehensive warranty is good for peace of mind. The Panasonic Toughpad FZ-T1 is a rugged Android handheld tablet. 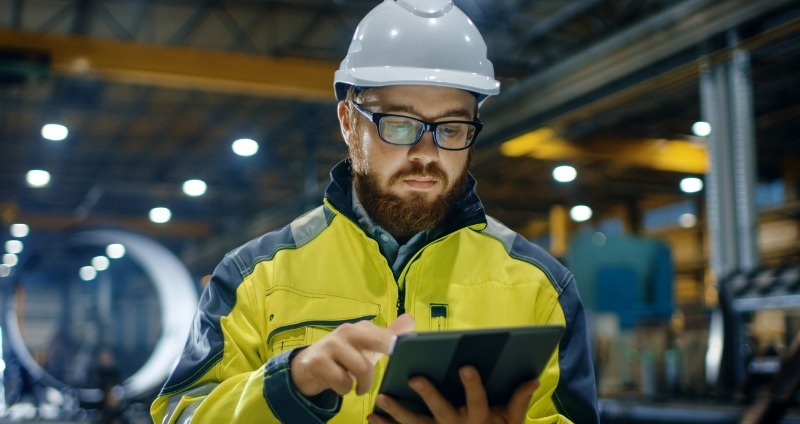 It’s small size is comparable to a smart phone so it’s recommended for retail, delivery, inventory and warehouse jobs that require compact handheld technology. 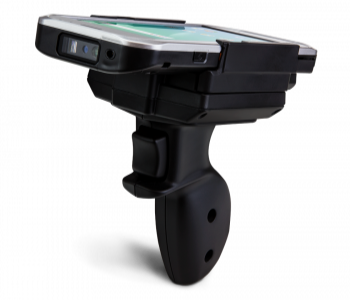 The built-in barcode reader means you could get rid of your old, separate, bulky barcode reader and have an all-in-one device. Panasonic understands that working with small devices in busy warehouses or shops can often lead to equipment falling out of your hands or falling off shelves, that’s why this toughpad is designed to be drop resistant up to 1.5 metres. Panasonic have also tested the FZ-T1 fully submerged underwater in a fish tank - it came out still working perfectly. Summary: Fully rugged, and phone sized the Panasonic Fz-T1 is recommended for people who need portability and the barcode reader. Best rugged tablet for warehousing, transport and logistics. This rugged tablet is best suited for use in the oil and gas industry. 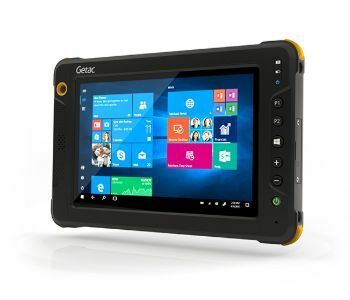 The Getac EX80 Rugged Tablet is intrinsically safe, which means it’s certified for use where fire hazards may exist and is capable of cross-zone operations in Zone 1, Zone 2, and non-hazardous locations. This rugged tablet can work in extreme temperatures ranging from -21 degrees celcius to 50 degrees celsius and can withstand drops up to 1.8 metres. The mid sized 8” screen means it’s more compact than the Getac F110, although - due to the extra intrinsically safe shielding - it’s slightly heavier at 1.48 kg. The IPS display is sunlight readable, essential given that it’s primary use is outdoors on oil rigs or oil fields. Lumibond 2.0 touch-responsive technology in the screen means you can use it with gloves and in the rain. Summary: The Getac EX80 is the best tough tablet for people in the oil & gas industry or anyone who works in hazardous areas. 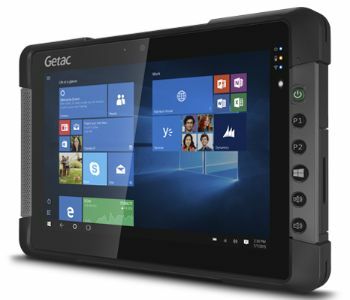 The Getac T800 - Rugged Tablet is a convenient size. With an 8” sunlight-readable screen it can be held comfortably with one hand. Best for users who favour portability over screen size - weighing 0.88 kg, it’s significantly lighter than the Getac F110. With the smaller screen comes better battery life - Getac claim up to 10 hours on a single charge and optional battery packs are available to extend that further. We recommend this tablet for vehicle installations because it comes ready with antenna ports ready for connection to a rooftop antenna to extend the GPS, WWAN and WLAN range. Like the other Getac rugged tablets the three year warranty is “bumper to bumper” which means you are even covered for accidental damage. Summary: Best for portability and mounting in a vehicle. If you need any advice on rugged tablets, don’t hesitate to ask one of the experts at Roaming Tech by calling 1300 131 933 or contact us online.